Tikta Ghrita is translated as “bitter ghee” and it is precisely this; ghee infused with the most powerful bitter herbs that Ayurveda has to offer. Ayurveda often uses medicated ghee infusions to administer herbs, as this allows for deeper penetration of the herb and therefore an overall more potent action and effect. The main bitter herbs of Ayurveda include Neem, Kutki, Kalmegha, Bhumyamalaki, Turmeric, Daruharidra, Karella (bitter melon) and Musta among many others. Although these herbs all have their own unique actions, they do possess similar qualities such as being detoxifying, cooling (mostly), reducing (catabolic), anti-bacterial, anti-inflammatory and act specifically on the liver and blood. Taking these bitter herbs infused into the ghee not only increases their potency due to the synergy of the herbs working together; but also because of the catalytic effect the ghee provides, as it works to drive the herbs deeper into the targeted tissues. Tikta Ghrita is a traditional Ayurvedic medicine that has been utilized for thousands of years. It is a vital part of any Ayurvedic cleanse during the “oiliation” phase, as it lubricates the internal body and pulls deep rooted toxins from the tissues. Although Tikta Ghrita is used in larger doses for a cleanse, it can also be taken in smaller doses on a daily basis for the treatment of a variety of disorders or simply for the routine maintenance of the system. Tikta Ghita is often used for liver disorders, inflammatory conditions (i.e. arthritis), to treat acne and other skin issues, toxic accumulation (especially in the liver and blood), excessive heat in the body, hormonal imbalance and most Pitta disorders. 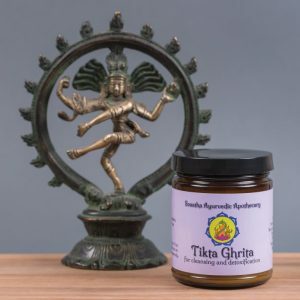 Purchase organic, handcrafted Tikta Ghrita here. Take 1-2 Tbsp of Tikta Ghrita each morning on an empty stomach. Mix this in 1/2 cup of warm water, stir until fully melted and then drink. Begin this at least 3-5 days prior to the cleanse, and then continue daily until the cleanse is over. After the cleanse, you can take 1 tsp of the Tikta Ghrita each morning for 7 days and then switch to a more rejuvenating medicine such as the Rasayana Ghrita (1 tsp, two times daily for 30 days post-cleanse). Take 1 tsp of Tikta Ghrita each morning on an empty stomach mixed and melted in 1/2 cup of warm water. Take this dosage again mid-day for more chronic disorders and imbalances. Take 1 tsp of Tikta Ghrita each morning on an empty stomach mixed and melted in 1/2 cup of warm water. Use consistently for best results. **Tikta Ghrita can also be used externally to make a skin-clearing, anti-aging Triphala Face Mask. Click here for the full recipe! For acute rashes, external hemorrhoids and the treatment of skin disorders such as eczema and psoriasis, follow the recommendation in #2 while simultaneously using the Tikta Ghrita externally. To use externally, take a dime to quarter size amount and apply to the effected area (make sure this area is clean) each night before bed. For more extreme conditions, reapply in the morning after bathing as well. Purchase organic, hand crafted Tikta Ghrita here. can we consume tikta ghrita daily ? as i am suffering from mild hot flashes and acne on my back which is a mild one.so will the tikta ghrita work and give permanent results? thank you! Danielle for the response .i was suffering from mild acne from last 4 years.wasn’t knowing that those are due to excess pitta . but last year i had severe acne on my body n face.some how i cured it by virechana n other ayurvedic medicines but still facing with the mild one.as i m skinny so doctors won’t allow for virechana as it can cause weight loss.now i am consuming mahamanjisthadi kwath and turmeric . so plz tell me what changes i should do in my daily routine.kind of frustrated due to acne!!!! I would like to know anything about Ayurveda medicines and treatment. Yes. Really I am interested to know any other information about Ayurveda. Ayurvedic medicine is a very vast subject. We have tons of articles on the various herbs and their heath benefits. You can find these here. You can also find specific treatments for common disorders, and some simple at home Ayurvedic remedies throughout the blog as well. If you have any specific questions feel free to write us through our contact page and I will be happy to help! We are lucky to have so much information for free on your blog , I am thankful to you . Thank you for the kind words! You can take small amounts of the mahatiktaka gritha (1/4-1/2 tsp daily), but I would avoid to take more than this until the cholesterol levels have been restored to normal. Taking a powdered formula with similar bitter herbs may be a better option otherwise. One extremely bitter and Pitta-reducing formula that will also reduce the Kapha (aka high cholesterol) is Mahasudarshana Churna. I would likely recommend this over the medicated ghee in your situation. Please let me know if you have any further questions! 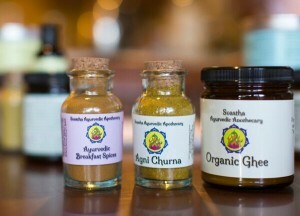 This is an amazing website and the products offer the best of Ayurveda. Thanks so much! I just ordered the Rasayan and Tikta Gritas. I have been suffering from SIBO (small intestine bacterial overgrowth) for the last 5 years after heavy antibiotics use. Do you think Tikta Grita would be sufficient is helping with that condition? I wasn’t sure if I should also get any of the parasite remedies. Thank you for writing in! Tikta Ghrita will be a great start to begin the healing for your gut flora. It will help to remove the unwanted bacteria and is very soothing for any inflammation in the small intestines that may be occurring due to the SIBO. I would also make sure to take plain, organic kefir or yogurt daily (homemade is best! ), or drink lassi (not mango lassi!) after meals. This will help build the good bacteria as you remove the bad. If this is not enough, you may have to look into the parasite tincture, basti (enema) or even the Mahasudarshana Churna. These are all very beneficial for killing off the unwanted bacteria as well. When you say the dosage to Tikta Ghrita of 1tsp. Is this a melted 1tsp or at room temp. I find that depending on the weather the ghee can be quite dense or melted. Thank you for your question! I recommend measuring the tsp using the solid ghee and then adding it to the warm water to melt. This method will work very well. Please let me know if you have any further questions! im suffreing from very hot feeling on the skin. i became very thin after using black pepper and green tea to for long time . it reduced my body fat much. now i became extremely thin with severe pms. pls suggest. Thank you for your question. It sounds like you are suffering from a Vata imbalance, low Ojas and hormonal imbalance with the low body weight. I would suggest following a Vata reducing diet that also focuses on increasing Ojas. I would not suggest the Tikta Ghrita, as this can be too bitter for Vata. 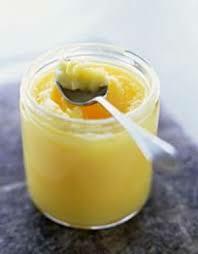 I would instead suggest a more building medicated ghee such as the Rasayana Ghrita. This formula will help to reduce the Vata, increase the Ojas and balance the hormones (and therefore reduce PMS). Please let me know if you have any further questions! Thnq very much mam. Where can i get this ghritha and what’s the dose? Pls tell me. i am suffering from Rashes red in colour since last one month on both legs below the knees but they are less itching. is it due to any allergy or blood impurity. I ate fish which i don’t eat normally before the rashes occured. What medicine do you suggest. Thank you for your question. It is hard to say the origin of the rashes without more information. It could be from an allergy, parasite, toxins in the blood stream and/or excessive heat in the liver. I would definitely avoid fish for now in case there was a correlation, but it could stem from other causes as well. I would try to keep the diet as healthy and simple as possible and take either the Mahasudarshana Churna and the Tikta Ghrita which are both very cooling and cleasning and specific for skin issues. You can also sip on CCF tea between meals which will also be beneficial. I wish you well!